Dinner rolls and biscuits often times join each other on the dinner table. Some folks prefer rolls while others like biscuits. I’m a biscuit person when given a choice, although I never turn down a good dinner roll either. These biscuits are so good that I just had to share them with you just in case your family is like mine and likes a variety of “breads” on the table. I suppose it doesn’t make much sense to rave about a recipe that starts with a baking mix and includes just a couple of other ingredients. And it probably doesn’t count that I literally had these mixed up in seconds yet I can’t praise them enough. They are light, fluffy, and reach- for- seconds delicious. They feel like they are going to float right out of your mouth! These biscuits are also great with a bowl of soup or a salad. 1. Preheat oven to 450*F Have ready a cookie sheet lined with parchment paper. 2. Combine baking mix, garlic powder, milk and cheddar cheese in a mixing bowl. Beat with wooden spoon until soft dough forms. 3. Drop dough by spoonfuls onto cookie sheet. I brushed them with butter before baking. After baking, golden and lightly browned with little crisp edges. 4. Melt butter and add chopped parsley. ** Brush over warm biscuits before removing from cookie sheet. Serve warm. **I like to brush the butter mixture on before and after baking. It makes them so much better. One of the pleasures of a holiday weekend for me is the slow start to my days. I like to linger over my coffee and enjoy a freshly baked “go with”, talk with Mr. D., plan out the day, catch up on the news and mail,etc. This past weekend was no exception. One of the baked goodies that I make often are biscuits, and quite frequently I add either dried or fresh fruits to add a little extra nutrition. This serves as breakfast many times, but they can certainly fit into a brunch menu, especially by adding in savory ingredients like crumbled bacon, chopped chives or grated cheese. The choice of add-ins is limited only by your imagination. 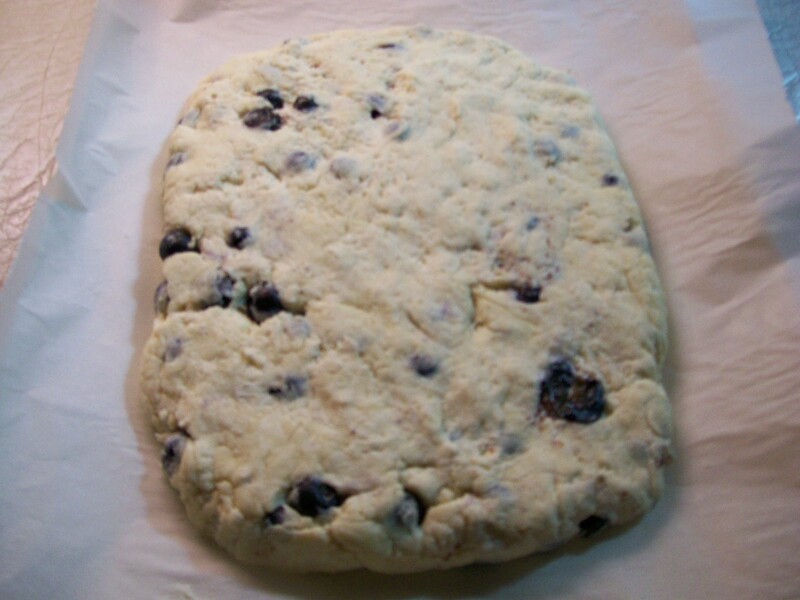 The biscuits I made this weekend contained blueberries , thus the name BLUEBERRY BISCUITS. They are super easy to make, with hands on time about 20 minutes, and baking time 17 minutes. The recipe makes 12 biscuits. These also make a nice biscuit base for strawberry shortcake. Going that route will produce a ” red, white, and blue” dessert for patriotic holidays. How neat is that? Preheat oven to 425 degrees. Prepare a parchment-lined baking sheet, or spray with non-stick spray. In a large bowl stir together flour, baking powder sugar, salt and nutmeg to thoroughly mix. 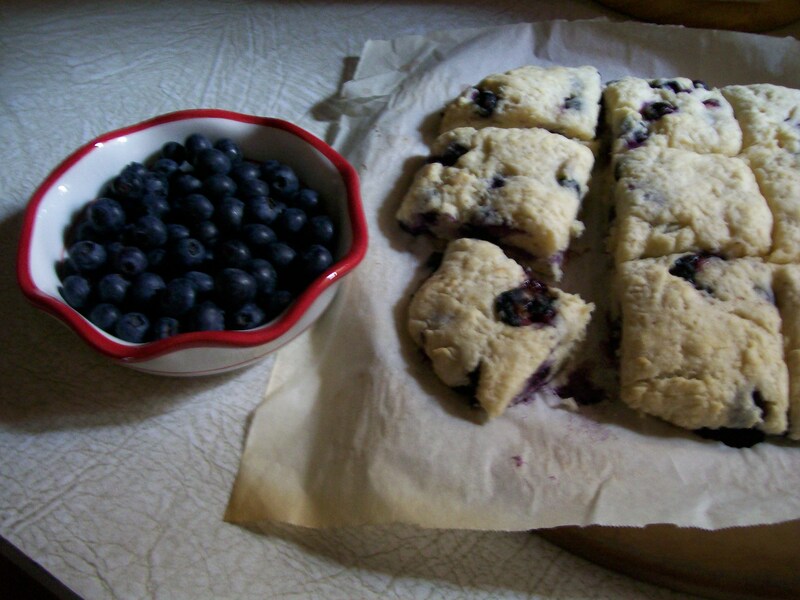 Cut in butter with pastry cutter to make coarse crumbs; stir in blueberries, then buttermilk. Mix minimally, just to moisten. Turn out onto a floured surface, gently lift and fold dough onto itself several times, turning a quarter turn with each fold. Place onto baking sheet. With palm of hands, form into a 7-8 inch square, approximately 1 inch thick. 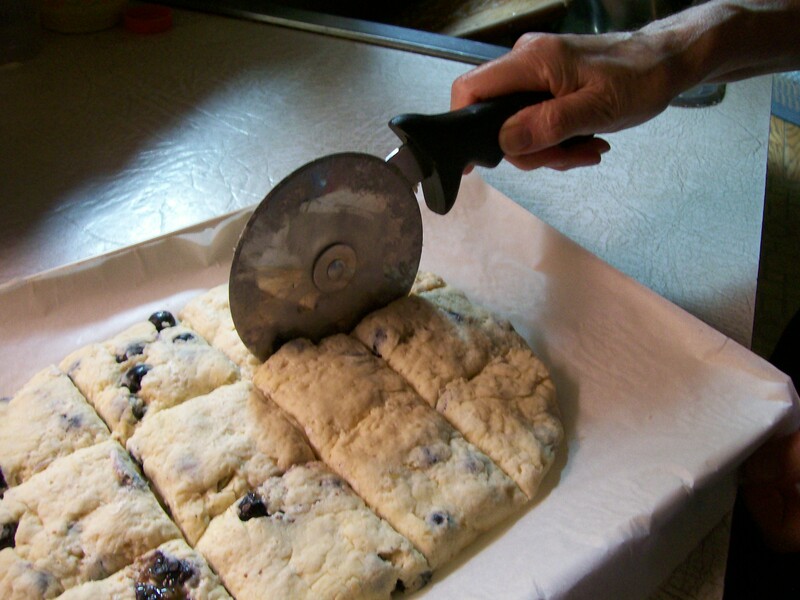 Using a floured knife o pizza cutter, cut into 12 biscuits, leaving them intact. Bake in upper half of oven for 17 to 20 minutes or until golden brown. Cut or pull apart to serve.